Ritmonio has revealed new colour concepts for its iconic Haptic and Diametro mixers, which allow users a greater choice when personalising their bathrooms. One concept, called the The World’s Colours’, presents the concrete handle of the Haptic series in eight new colours: Tramonto, Canyon, Oceano, Vulcano, Artide, Tundra, Amazzonia, Sahara. Ritmonio has also come up with a ‘Black & White’ concept for the Haptic and Diametro 35 series, offering them both in black and white finishes. 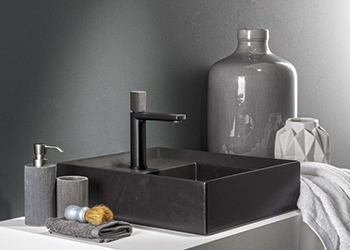 Simple and classy, the Black & White version combines a contemporary design with the tradition of “Made in Italy” excellence, says Ritmonio, adding that the matt texture makes the products “elegant and exclusive”. Together, the concepts offer over 100 possible combinations allow for different configurations and tailor made solutions, with multiple compositions that fit perfectly with the architectural mood of the rest of the environment, it adds. Hexagon ... new collection from Gan. Overlays and visual effects come together as a geometric puzzle in Gan’s new kilim collection called Parquet, created by the Swedish design team Front. 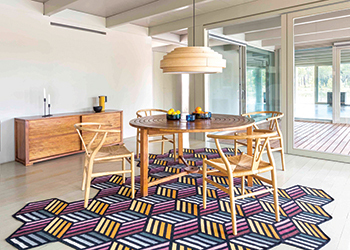 Anna Lindgren and Sofia Lagerkvist have combined the patterns and geometries of traditional flooring with new shapes and colours, creating rugs that feature a three-dimensional matrix, accentuated by their irregular shapes. Parquet embraces Gan’s philosophy of integrating traditional and new elements with Scandinavian simplicity. Using simple geometric figures with four to eight sides as building blocks, the Swedish designers have created three models of reversible kilims: Tetragon, Rhomb and Hexagon. The three designs are made completely from pure new wool in manual looms, operated by skilled craftsmen and women from India. Their shapes move away from the classic rectangle, and the designs and colours manage to visually enlarge the space in which they are located, and open it to new dimensions, with daring and freshness. Tetragon is the most colourful rug in this collection, with a mix of greys, blue, yellow, pink and dark green. Rhomb takes a more organic shape, with less angular contours and a soberer chromatic range expressed in yellows, greys and whites. Hexagon declines in reds and oranges, captured in cubic motifs divided into vertical lines that play to create overlays and stratifications. Each model is available in two different sizes. Met by Aran Cucine is the metropolitan future kitchen: a flexible piece of furniture that is able to move, transform and adapt to new lifestyles and consumptions. “Met stems from the need to think of a furniture that joins in a self-supporting block to all typical functions of a kitchen in a little space without sacrificing the usability,” says the spokesman. “From the first look, the large counter of the Met is a console and an orderly, pleasant living area. 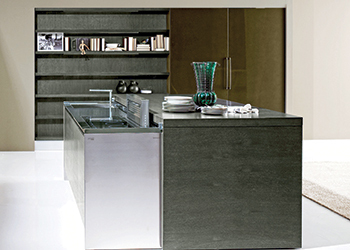 But it turns into the kitchen with a very easy and convenient extension mechanism. Safety sensors check for objects that can prevent the closure during the cover’s movements, stopping immediately the movement in case of obstacles. The hood and tap are retractable. Met has a certificate of safety for domestic use.